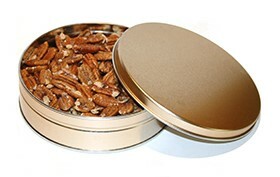 1# Tin Extra Fancy Mixed Nuts - a perfect combo of our gourmet pecans with a variety of other gourmet nuts! A peanut-free fancy mixed nut variety including pecans, blanched and unblanched almonds, brazil nuts, blanched filberts, and finally topped off with shelled pistachios. VIEW ENLARGED IMAGE FOR TIN SELECTION. 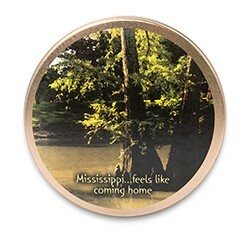 WHEN YOU CHECKOUT, TYPE YOUR SELECTION UNDER THE COMMENTS AND SPECIAL INSTRUCTIONS BOX- Magnolia Tin (M), Bayou Scene Tin (B), Cotton Boll Tin (C), Holiday Tin (X). 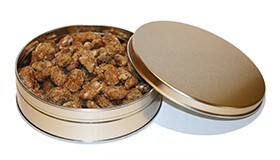 Try our original praline pecans with your mixed nuts! Try some of our roasted & salted pecans with your mixed nuts! The more pecans, the better!